We provide a vast range of Busbar Insulation Shrouds that are fabricated from polyvinyl Chloride (PVC) material. Bus boot is flexible electrical insulating boot / shroud for busbar and switchgear connections upto 36KV. These pliable boots can be installed, removed or replaced in few minutes. Made from specially formulated Polyvinyl Chloride (PVC) material to provide excellent electrical insulation and to withstand higher operating temperature continuously. Busboot provides reduction in air clearance, which helps designing compact panels; thereby reduces the material costs by. saving in busbar lenghs, sheet metal components, etc. 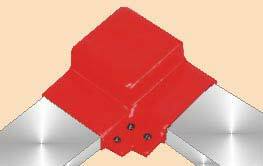 It is also call as busbar connection shroud / busbar joint cover, protection shroud(boot) etc. Tested to ANSI C 37.20.2 Standards for medium voltage switchgear application upto 36KV. The most cost effective way to insulate connections in Switchgears. Easy to Install or Remove as often as required. Highly resistant to UV rays and ozone. Good for outdoor or indoor applications. New design moulds can be developed in a week. Excellent electrical & thermal properties. Customised design possible for any shapes or connections. Low tooling cost...a fraction of injection molding. No internal stress molded into parts. Large parts can be made without significant tooling investment.